Giveaway Winners and Works in Progress! Flower Garden Crazy Mat Progress! I have been busy this week working on projects and I finally cleaned up my sewing room so I can make a mess again. 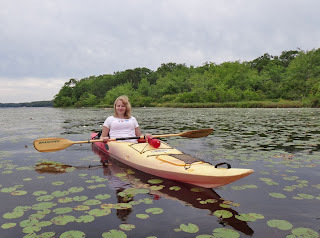 On the previous post, some thought those were photos of me, they are my daughter who is living with us again and now she is paddling with us. 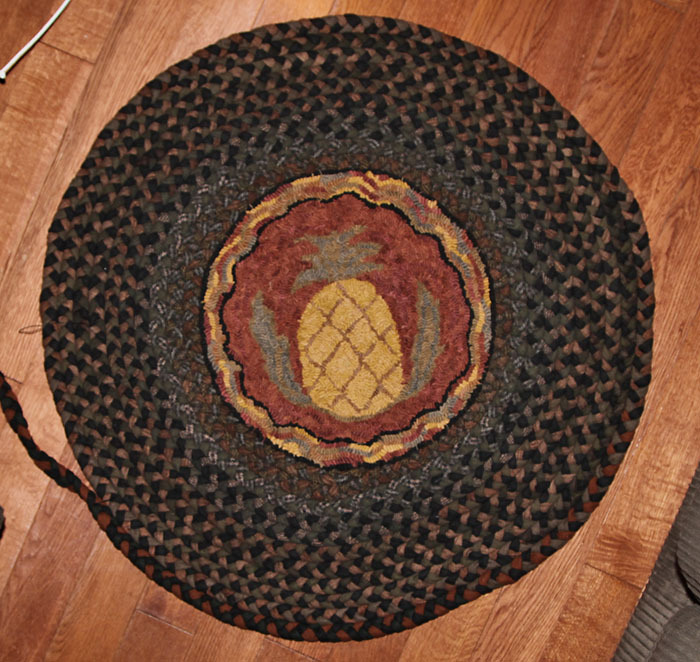 I started the braided rug again, but this time I added a hooked chair pad to the center. I have never done this and thought it would be fun to try. I sewed the braid around the edge of the rug by catching the edge of the backing. Once I got a few rows on, I folded the leftover backing in half and sewed that to the braids. I did it that way because the rug was a bit thicker than the braids and this evened it out by raising the first few rows of braids to the same height. I am just going to sew it around until I run out of braid and then use it on the living room floor. Later I will start a thicker braid and make a full sized rug for the room. I have a broken tail bone from riding on a toboggan without a pad, not a smart thing to do. 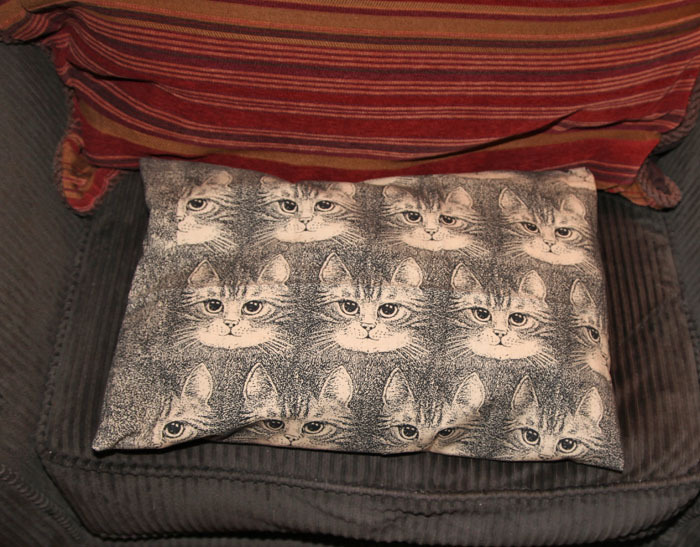 My new couch is not comfy on my tailbone so I got a travel pillow to sit on and today I made a quick cover for it. I just made it to the size with a little extra and left a small opening and stitched that up by hand. Nothing fancy, but it does the trick. Another surprise this week was a gift from my friend Fannie Narte. She is a wonderful artist and does beautiful paintings which she has printed into panels to use in sewing projects. She offered a panel to anyone who asked and not only did she send me a beautiful panel to make a sachet with, but she sent me a finished one that she personalized with my name on the back, I love it. It is filled with organic french lavender. Be sure to visit her Shop, she has a lot of wonderful designs that are perfect to use in gifts for friends. 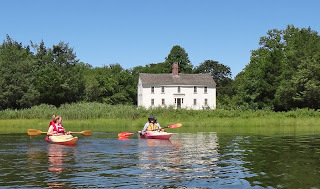 Another beautiful weekend and of course the perfect weekend for paddling. 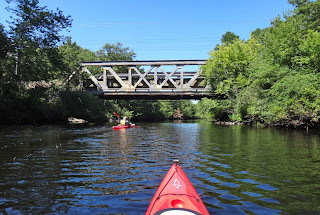 Saturday was cooler, so we did a river paddle. 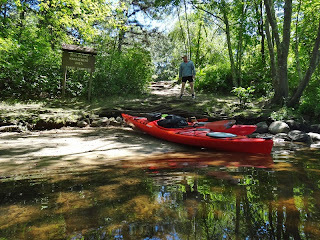 Except for a few people passing by, we had the river to ourselves and the critters who crossed our path. We saw a beaver, a blue heron, hawks and lots of turtles but nothing that would sit still long enough for a photo. 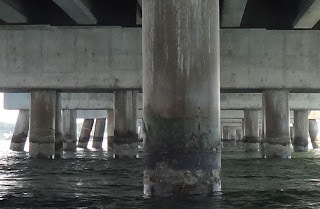 The river is long and winding and passes under several roads and railroad bridges. 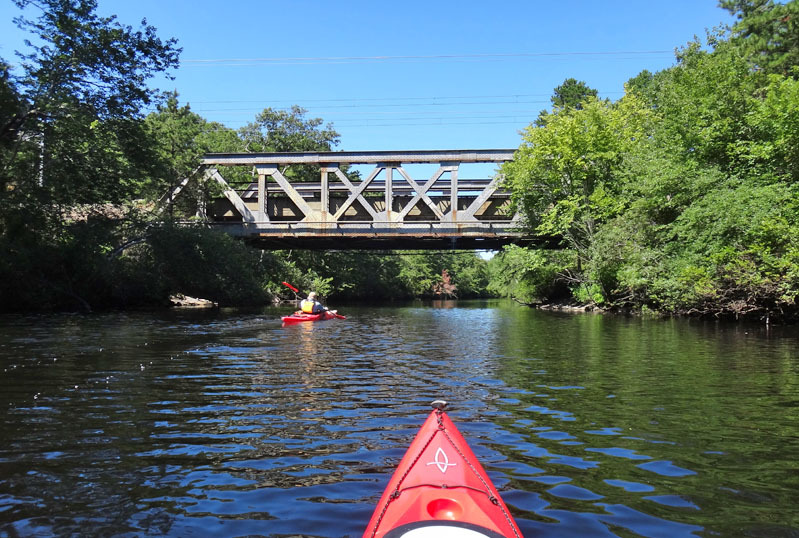 This is an old trestle bridge. 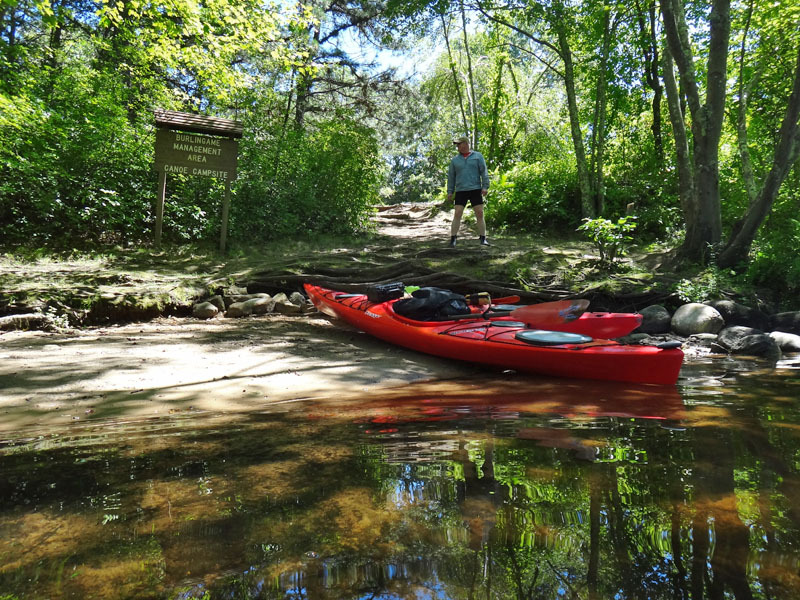 We always stop at the state park, wilderness canoe campground. I think it would be fun to camp there, but it is really buggy at the sites which are up on the hill. The blueberry bushes are all empty but their are grapevines lining the river. 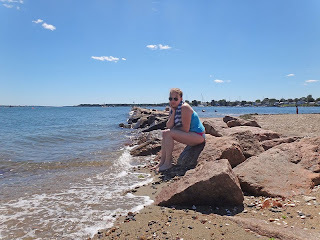 Sunday was warmer so we went to the salt water marsh and paddled out to the breakers. We bought our umbrella and just enjoyed sitting on the beach. We had our own little spot to sit and cool down in the water while we watched the boats go by. 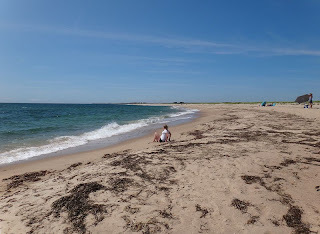 The ocean is just over the dunes, a perfect place to walk around and enjoy the cool breezes. On the way back, we passed this guy. I am glad I didn't meet him while we were swimming in the water. 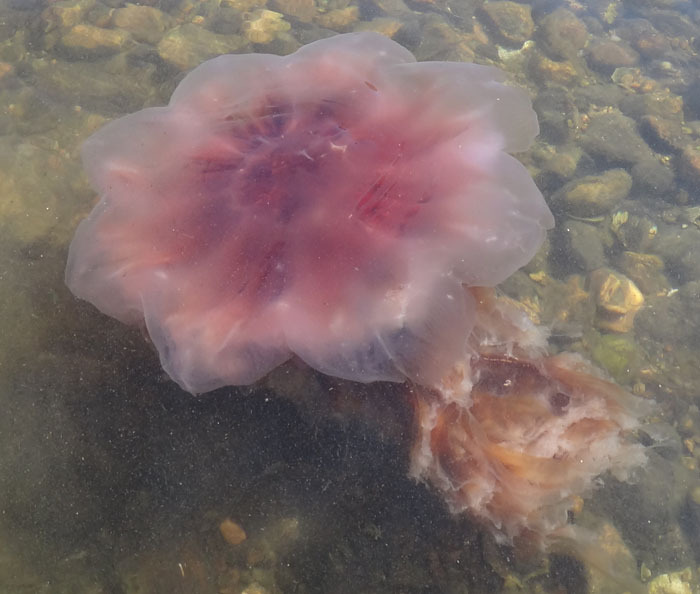 It is called a Lion's Mane jellyfish and they can grow up to 120 feet long with their tentacles. I hope everyone had a wonderful weekend, as well. I still have the words and some details to finish. Another thing I decided was to redo my braided rug. I was going to make stair treads and gave up on that idea so kept going and the rug was going to be too long for what I wanted. I also used lighter weights and smaller strips and realized it would not make a durable rug for the long haul, so I took it apart. 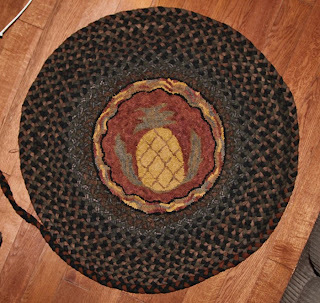 I have a pineapple chair pad that I made and thought it would be perfect to put in the middle and the braid around it, and have it become a circle rug. 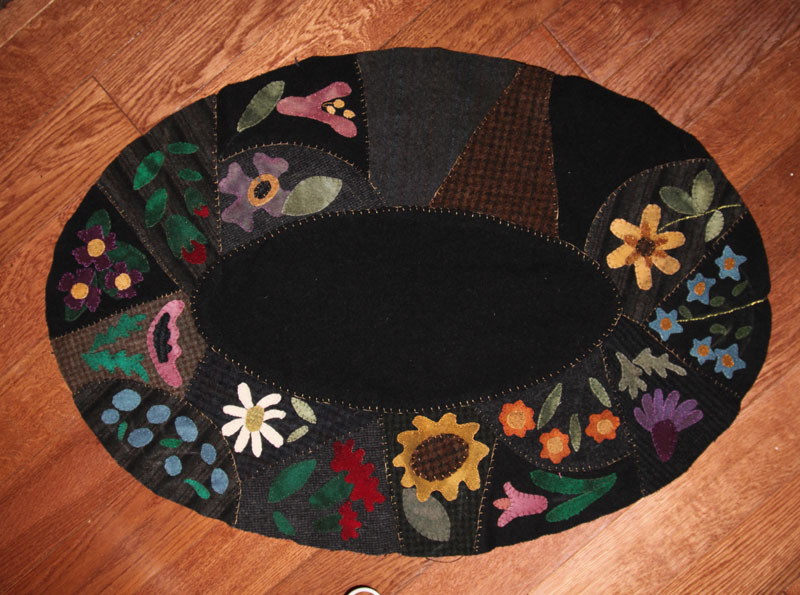 It will be good practice to do a circle rug and learning how to attach a braid to a rug, to see how I like it. 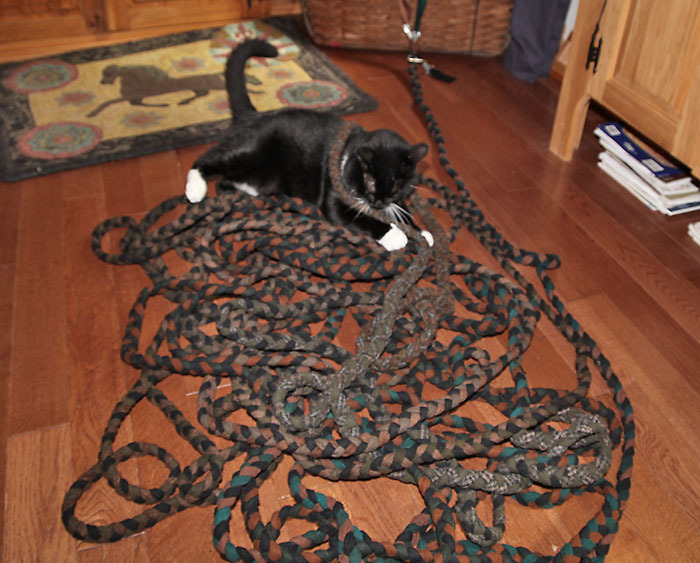 Moki likes it just the way it is, the perfect cat toy. And now for the winners! I picked two winners and they are....... Wendy of Ravenwood Whimzies and Missie of Hallbrook designs. Email me with your epattern choice. I hope everyone has a wonderful weekend. 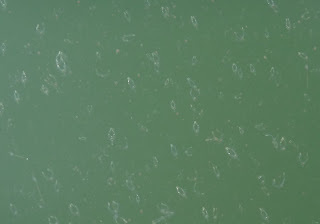 As for the things in the water, I have no idea what they are, just that there were thousands of them in clusters, so I assume it was something that bloomed or hatched. You could not ask for a more perfect day for paddling, the inner bay was as smooth as glass. 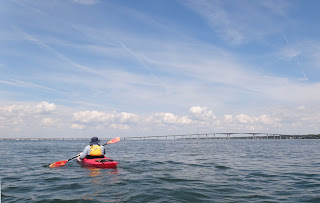 We paddled straight for the bridge, stops were made on the water to get a drink and rest my arms. 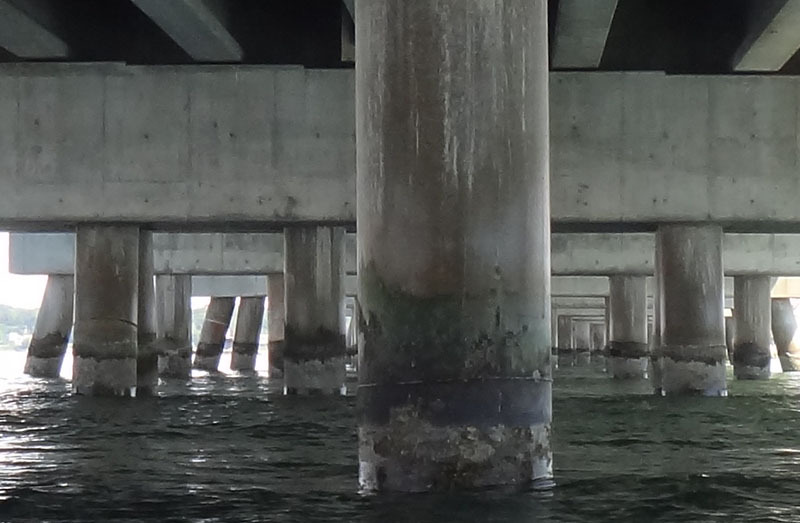 This is what is is like when you go under the bridge, today was calmer so I could take a photo as I passed under. 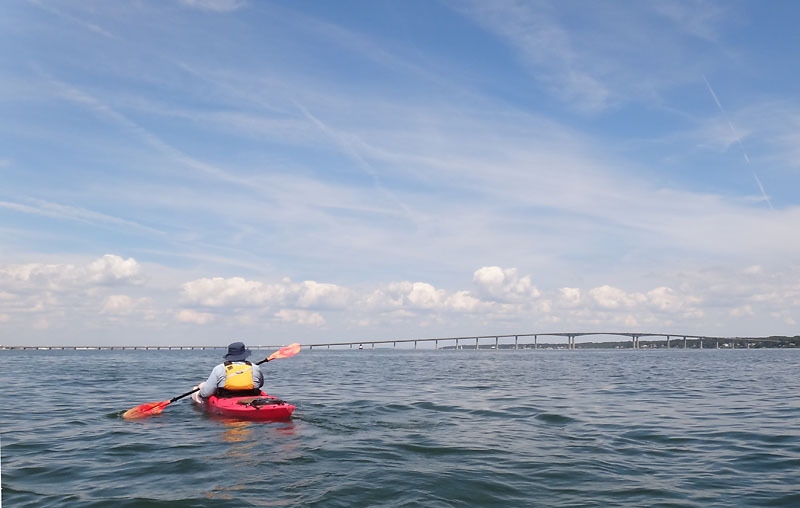 Usually the waves and currents pull you back and forth so you have to paddle fast to go through to keep on a straight line. Coming out to the other side. We stopped to take a quick rest on this side, we still had more paddling to do. 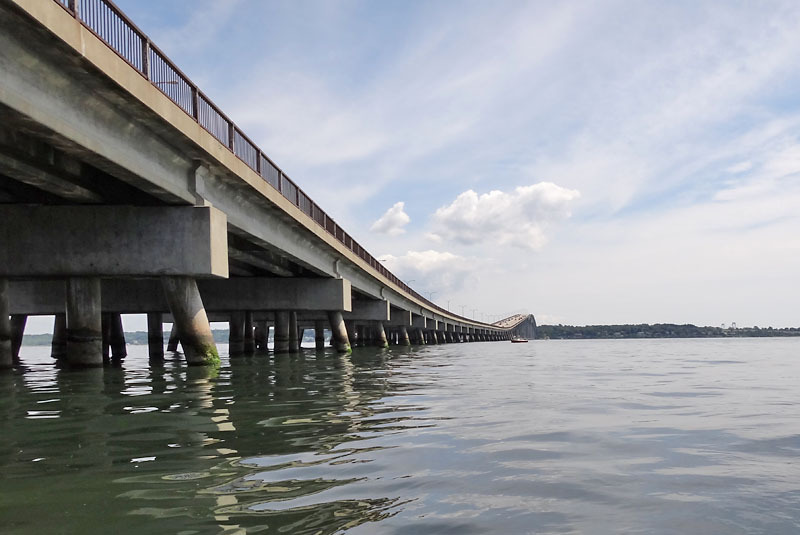 This is the Jamestown bridge and from Jamestown, you can go over to Newport. Sunday was a rest day. 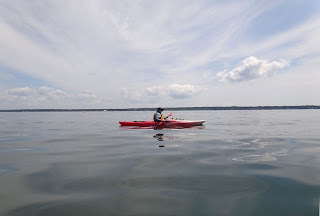 My idea of rest is to paddle at the lake so I can stop and swim and just paddle along the shorelines and not push myself. 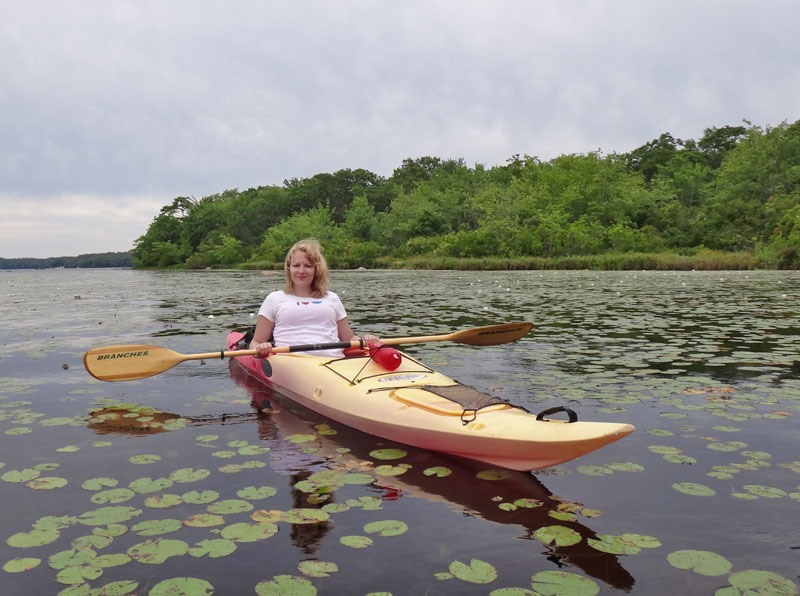 My daughter came with us and the cloudy day made for some heat free paddling. On Saturday we had a cookout with the kids and of course I got to spoil my grandson. They always like to go shopping while they are in the area, so they leave him here with me while they shop. I was making silly noises and making him laugh, but hard to take photos when he changes expressions so much and kept kicking me, lol. He is so alert and not even 3 months yet, he is has so much personality. And now for the giveaway. This week it will be your choice of one of my epatterns. 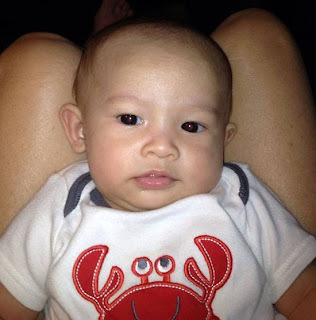 You can make a comment, or you can add a caption to the second photo of Nicholas, or you can tell me what the heck the next photo is? On the way back we paddled through swarms of these things, they were like thin lines that bent and moved on their own, as well as drifting with the tide. I have no idea what they were. I will draw two names from the comments on this post and two people will win their choice of a pattern. I will keep the giveaway open until friday night and draw a winner and announce it on Friday. 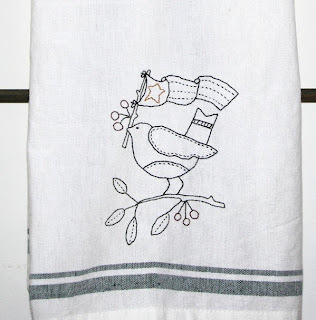 Yesterday I decided to try another tea towel. I used a design by Buttermilk basin so I could make a fall towel for next month. 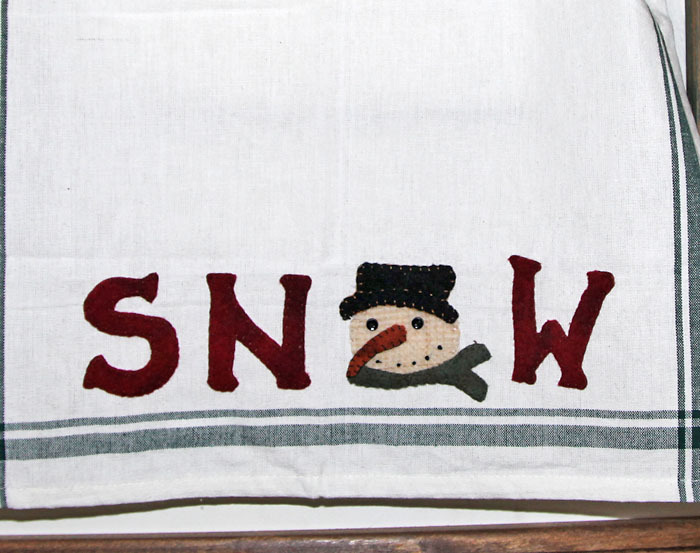 I reduced the design by 20% to fit the towel and sewed it one with a blanket stitch. 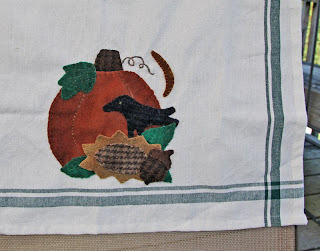 One thing I am noticing is the towels are bright white, so I might try tea staining one to see how I like it, then I can do some with primitive stitcheries with christmas designs as gifts. The towels are Aunt Martha's and with a coupon, well worth getting and easy to work on. I might just stain this one with tea, might give it a more prim look. The wool is prim, but I have to lighten it, so you can see the details. 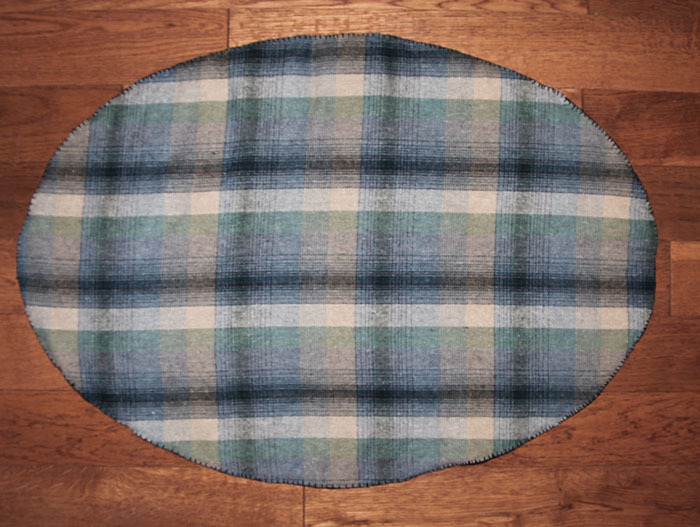 I finally finished my wool mat, though I took a few short cuts to make it go faster and get it done. I did not add the bugs or spider web, I just wanted a flower piece for my table. The problem is, it doesn't look good on my table so I need to find a place for it or maybe it will be a gift. I finished it off by adding a linen backing and a blanket stitch. 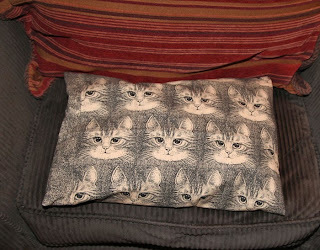 The original was done with a nice edge, but I am too lazy to make a binding. Not perfect, but not bad. Pattern is Flower Garden Crazy, by Primitive Gatherings. For the back, I used a linen that has the feel of wool. I found it in a thrift shop and I thought it would be nice for a backing. I cut out the design and left about a half inch of excess so I could tuck it under and keep a nice edge on the back. I pinned it and turned the edge under as I did the blanket stitch, not perfect, but not bad;) The crooked edge came about when I did the stems, I was a bit tight on the stitching. I hope you all had a wonderful weekend. 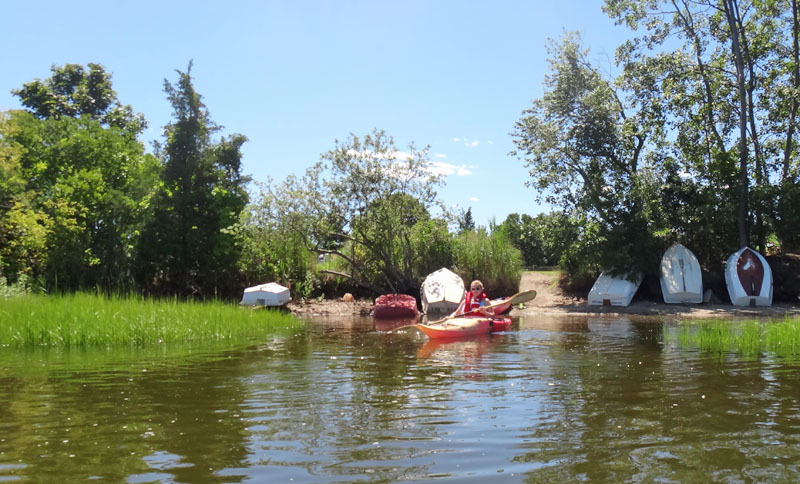 We had a beautiful day yesterday and I decided to get out for a paddle. We went to the town launch and stayed in the cove. 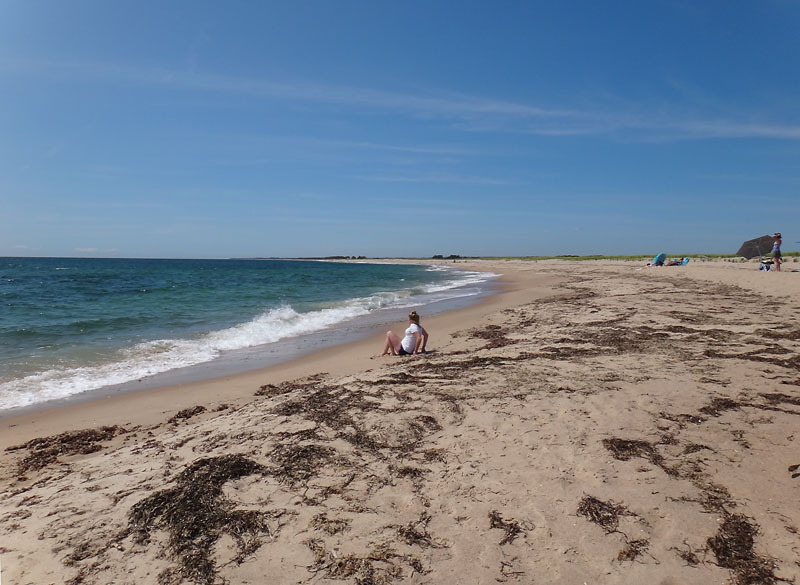 It was high tide so it makes it nice to be able to go in and out of the coves and not worry about hitting bottom. My daughter wanted to go, she is loving kayaking but she needs better gear. Dad and Daughter paddling past Smith's Castle. 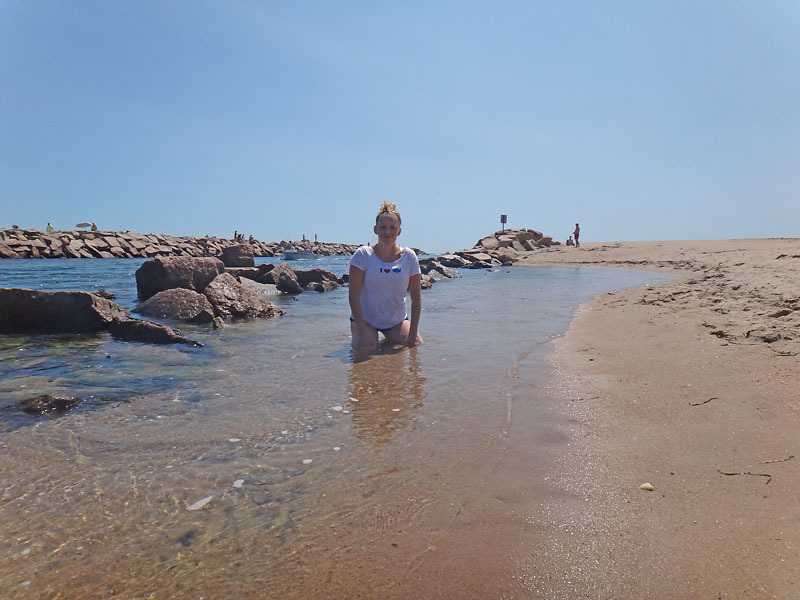 We went around a few coves and landed at the little beach by the breakers. This is the perfect spot to relax and enjoy the views and take a swim. We even had some visitors. 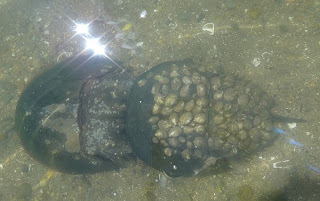 The circle of life continues, even for horseshoe crabs, lol. This week I have been working on my wool crazy mat and the bird stitchery. I want to use the mat before summer is over and finally getting to the end. 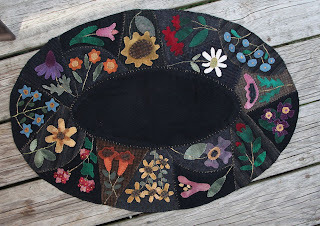 Once I finish the last wool appliques, I can add the stems and extra stitching. On the original they added a border, but I am just going to add a backing and do a blanket stitch around it. 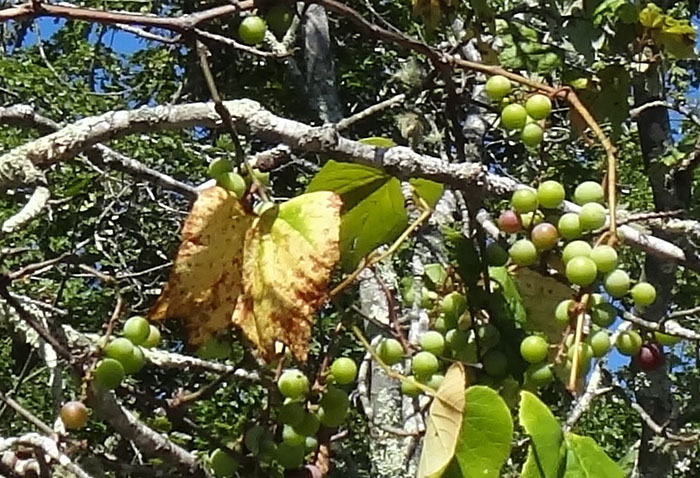 I am trying to stay close to the colors they used and using what I have but hard to see the true colors and shades in the photo. The flash makes the colors come out too brassy and the blacks too light. 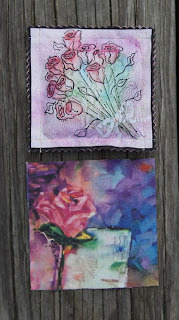 I also find that they way I pieced the blocks made them smaller so I have to reduce some of the flowers to fit. The pattern is by Primitive Gatherings and I think it will be a nice pattern to keep for the flowers and make smaller pieces with them. The original also has a spider web, where the white daisy is. I turned it around and left it plain. I tried some pearl cotton on a couple of the flowers on the right, I like the thicker thread for the stems, what do you think? I found it at a yard sale and over dyed it so it is dark and light green shades. A few weeks ago, I got some tea towels from Jo anns with a coupon, to try them out. I really like the loose weave and vintage look and it is something I can stitch or applique as gifts. They come in different colors, but green is my color and perfect for halloween or Christmas. 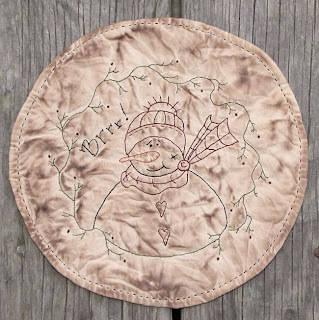 The first one I did with a stitchery, that I got from Kathy Schmitz. She has a newsletter and she offers free patterns in each issue, and this one worked perfectly for the tea towel. 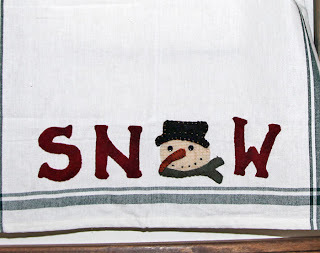 These are fun to do and we all have appliques that can be used for towels or reduce ones that are too large. With a coupon, it is cheaper than making your own and they work up quickly. I really enjoyed reading all of the misadventures of everyone's vacations, I think we all have those. I have been taking my meds and finally starting to feel human again, so hopefully it will stay that way. 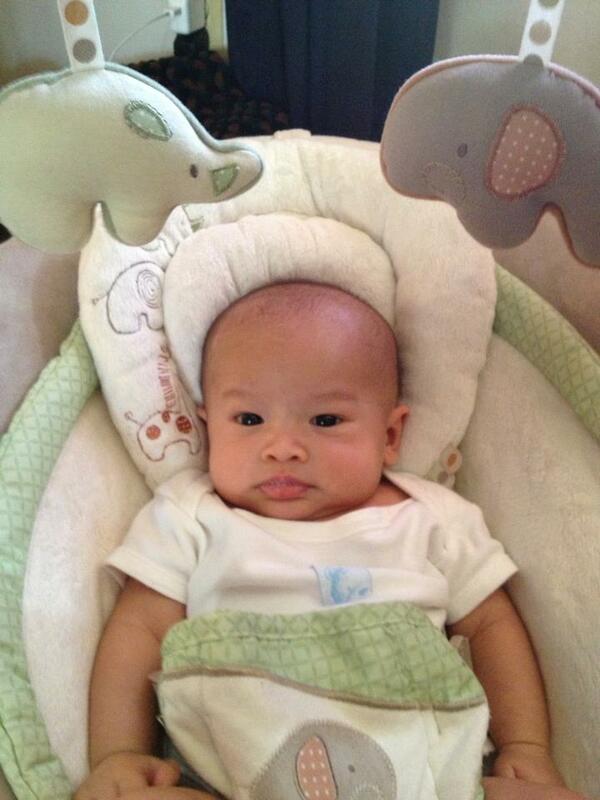 This weekend I got to see my sweet grandson twice, so that is always a mood booster. 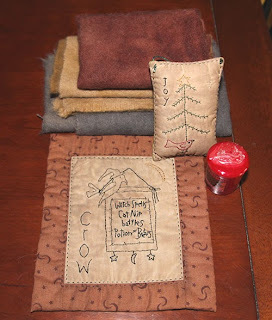 The winner of the prize package, which has a couple of extra goodies added to it is: Jean at Prim Crafts! And for a third prize, the winner gets their choice of one of my epatterns or booklets. The winner is Cathy of Acorn Hollow! Congratulations to the winners and thank you for all of your wonderful comments and support. I am hoping to get back into creating this year, so look for some new patterns and I will also try to do freebies when I can as my gift to all of you. Jean, please email me with your address so I can mail out your package and Cathy, email me with your choice of epattern. 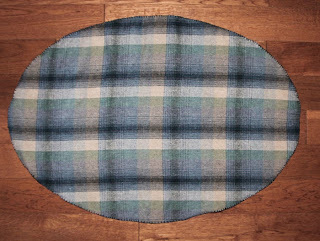 For those of you who would like to make your own candle mat, Tiffany has her website back online. 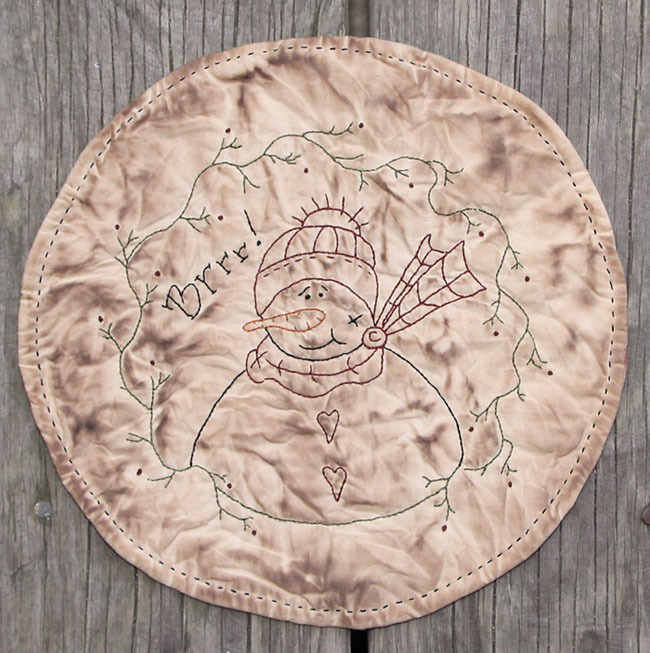 She was away and didn't realize it was due, so now you can download the snowman design or any of her wonderful free designs. 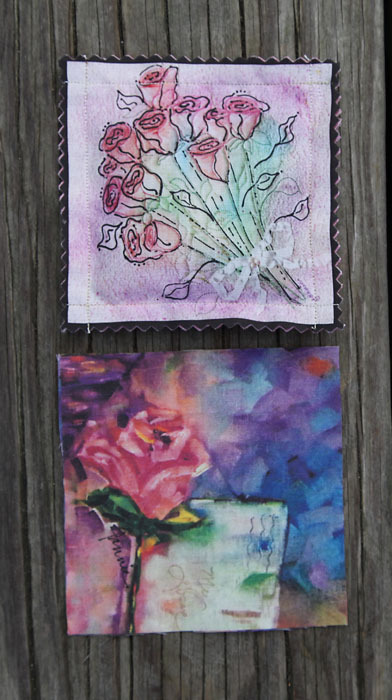 She also has some wonderful designs that are reasonably priced and great for all types of mediums. One thing I wanted to mention, is that Tiffany is helping a friend who has stage 4 brain cancer. 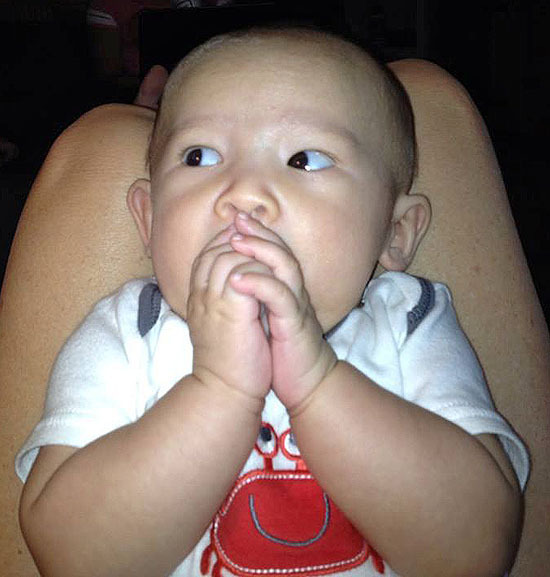 They are working on a bucket list and Tiffany needs help with expenses for their trips. If you would like to read more about Bonnie's story and the things that she has been able to do with Tiffany, you can visit their blog, Bonnie's Blessings to learn more. Her story will touch your heart. Today I finished another candle mat, the winner can have their choice of the first one, or this one, I will let you decide. This one is more fun but more prim with the staining. The design is by Michelle Ridgeway Designs. You can find the freebie on her right side bar. I had to clean out my wool bins and put the wool in boxes for now and I picked out some camel hair wool, that I hand dyed. 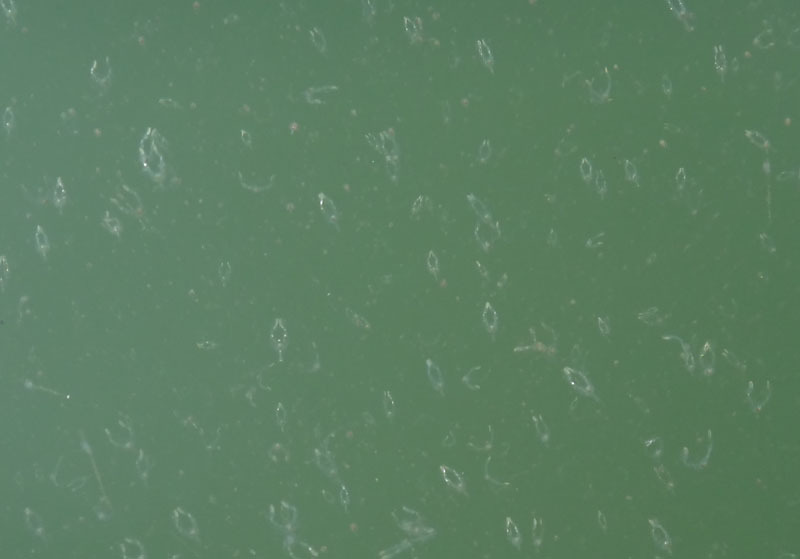 It is a super soft wool that can be used in different types of projects. Also a mini halloween quilt, a christmas pillow and a candle. I will wait on the patterns after I choose a name, since some of you like to quilt, punch or stitch, I will customize those to your likes. I also said that I would pick a name on Sunday. I will do that and then announce it on monday. I have not had the best week and still recovering, so I will take a break till Monday and see what else I can add to the box. I hate to send out a box that isn't full;) I hope you all have a wonderful weekend! If you would like to enter the contest, you have till Sunday night, 10pm EST. You must leave your comment at THIS POST to be entered. I have enjoyed reading your comments and I think I can say, done that, been there, lol.